There are so many stories, so many names, so many people to remember from my tours in Afghanistan. My first year in Afghanistan, I stood and saluted at many Fallen Comrades ceremonies at Bagram Airfield as fallen troops were transported to the flightline for their return home. An astonishing number of medics and medical staff from my task force that year were killed by both enemy fire and by accidents during combat operations. An even more astonishing number of troops from 10th Mountain Division, the large command to which I belonged, were killed during that year as well. There are too many names and individual stories to list here. I’ve written twice for WNYC’s “The Takeaway” as sort of snapshots of remembrance for Memorial Day. One was written in NYC in 2009, the other was the following year while I was deployed for the second time in Afghanistan. “We lost Pena.” The words went through me like a lightning bolt, and the moment I heard them is frozen in my mind like a photograph: me, standing next to my desk in my supply office at Bagram Airfield, Afghanistan, Lieutenant Rod standing next to me, the green rubber flooring, the plywood walls. It was there in my office, on the hot, dusty afternoon of June 14, 2006, that I learned Sergeant Roger P. Pena, Jr., had been killed in action. We were nearly halfway through our year-long deployment, and we had already witnessed at least a dozen “Fallen Comrades” ceremonies at Bagram. For each ceremony, an announcement is made over the post-wide loudspeaker for all available personnel to stop what they’re doing and report to the main drive at Bagram Airfield. Humvees pass slowly down the drive, carrying the fallen troops in flag-draped steel caskets. Hundreds of troops salute as the fallen pass by on their way up to the flightline, where they are then loaded into airplanes for the journey home. These ceremonies unfortunately were commonplace. But we took them very seriously each and every time. Sergeant Roger P. Pena, Jr., was assigned as one of two medics from my company on a logistics convoy team supporting offensive operations in Helmand Province, one of the most volatile areas in Afghanistan. As they moved through the vicinity of Musa Qala, the convoy fell under heavy attack and Sergeant Pena was fatally struck in his vehicle. He was 29 years old, from San Antonio, Texas, and was survived by his devastated parents, his loving wife, and their two little boys. This story maybe seems commonplace after years of persistent news of the conflicts, with over 680 troops killed in Afghanistan and over 4,300 killed in Iraq. But it was unique to the 92 soldiers in my company. Sergeant Pena was one of the strongest medics and soldiers in my company, and for that reason he was asked to serve on that convoy team. He willingly accepted. Sergeant Pena was also one of the soldiers in my company who really brought people together as a team. His smile, his laugh, and his persistently positive attitude were infectious. He and his wife always seemed to be helping out the other soldiers or inviting them into their home to make them feel like family. I wasn’t surprised to me to learn that one Thanksgiving he drove forty-five minutes or so to pick up soldiers at the barracks to bring them to his home for a family holiday. So when it was Sergeant Pena in the Fallen Comrades ceremony, it was very different for us. Instead of lining the main drive at Bagram, we stood directly on the flightline to receive the humvee with his flag-draped casket. I stood in the cordon of twenty or so soldiers standing on both sides of the ramp going into the airplane. When the humvee pulled up, we all snapped to attention. Sergeant Pena’s dearest friends lifted his casket from the back of the humvee and carried it through the cordon, and we stood still, hands up at a salute, until Sergeant Pena was carried up into the airplane and the ramp closed. We kept our military bearing, but most of us had tears rolling down our faces. Thinking of you this Memorial Day, Sgt. Roger P. Pena, Jr. It was an honor to serve as your supply sergeant and alongside you with some of the best soldiers and people I have ever met. I regret that I did not know you well enough to experience first-hand all of the wonderful things that so many people appreciated about you: your tremendous integrity and generosity, your genuine concern for all those who surrounded you, your deep loyalty to your family. What I did know about you first-hand was your enthusiasm for anything that was asked of you (I myself asked you to help out with many supply details! ), your contagious smile and positive attitude (even when I was cranky with you guys! ), and the knowledge that you were 100% reliable to get a job done and to be always in the right place, doing the right thing. I know that you went on that mission because you were one of our very best medics. I know that on that day you were in your proper place, doing exactly what was asked of you, and to the best of your ability. I am so deeply proud of who you were and what you did. Coming home from Afghanistan without you will forever leave a hole in my heart. I prepared reports to account for your lost and destroyed equipment. But there was no accounting for the loss of you. Your night vision goggles inexplicably came back to us a few months after the incident. For a while I had dreams that you came back. I had another dream about you the other night, so I am writing to you to let you know this. You would probably remember me as just a cranky and eccentric supply sergeant. But I will always remember you as a hero. Each Memorial Day since I have remembered Sergeant Pena, and I remember the profound sense of loss we all felt for Sergeant Pena each time I read the names of other servicemen and servicewomen who have fallen in Afghanistan or Iraq, and when I visit war memorials and cemeteries. Each loss is personal. Each loss is devastating. But each loss also challenges us to do better, to be better people. As I continue in my military career, I think of Sergeant Pena and his family, and I strive to be a leader worthy to lead soldiers like Sergeant Pena, and worthy of the trust and confidence of families like the parents, the lovely wife, and two handsome little boys that Sergeant Pena left behind. Sergeant Pena, and countless other committed servicemen and women over our country’s history, stood up and volunteered to give his best every time his country needed him. The rest of us can only hope to be worthy of such service and do our best to emulate it. During the long, dusty convoy from my base in the mountains of Paktya province, Afghanistan, to Bagram Airfield, it never occurred to me that I’d be returning to the emotional moments of my first deployment here. This is what I am thinking about this Memorial Day here in Afghanistan. Our cargo trucks and gun trucks crept along battered roads through breathtaking mountain passes, lush, green valleys of farmland and mud-brick qalats, and busy roadside bazaars of fruits and vegetables, hanging meat carcasses, and even a few vendors selling plastic carts filled with ice cream. Afghan National Army soldiers rolled along with us in their own vehicles as a combined convoy, where we work together to run our logistical missions as a truly combined effort. We arrived at Bagram in the evening, and I invited two Afghan officers to walk with me along the bustling main drive. They asked to bring along one of their drivers, who was having trouble with an eye infection. So our first stop was the hospital to have this soldier seen by a doctor. I knew the hospital well from my first tour, where my task force worked to move everything from the old plywood hospital into a newly constructed permanent facility. 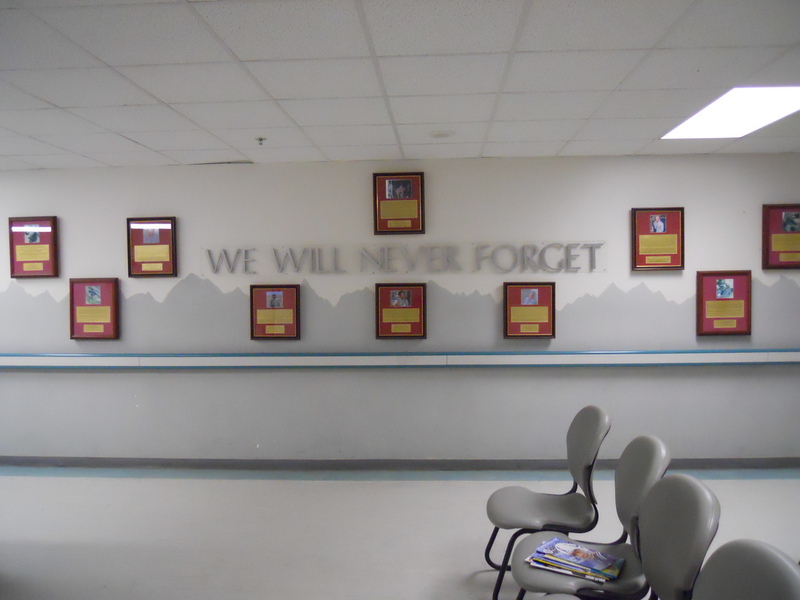 When we left in early 2007, there was much discussion of establishing a memorial wall in the hospital lobby to honor the service and sacrifice of the medics killed in action during our tour. I didn’t know what the end result was—until last week, when I walked into the hospital with these Afghan soldiers. At first I led the Afghans past the memorial wall, not stopping to look at the series of plaques with the names, photos, and stories of the fallen, along with a sign in large block letters: “WE WILL NEVER FORGET.” I knew many of the names and stories already. We took the Afghan soldier to an examination room and left the interpreter with him, while the two officers and I waited in the lobby. As we waited, I thought back to 2006, to the Fallen Comrades ceremonies, when we would stand along Bagram’s main drive, saluting the flag-draped caskets passing by in Humvees. I thought back to the loss of Sergeant Roger P. Pena, Jr., whom I knew personally as a comrade in my unit, and whose name I wear on a black metal wristband. I talked with these two Afghan officers using what words and phrases they knew in English and what few words I knew in Dari, even drawing pictures. I learned that the senior of these two officers was a captain, who had begun his career in the Afghan army under the Soviet occupation, even being awarded a medal for valor by then-President Najibullah. He described this in his formal, military tone, rubbing his fingers along his trim black beard as he reminisced. Surely these men have seen such great loss throughout their military careers and personal lives in Afghanistan. I wanted to tell them about the memorial wall, but it was too complex to communicate without our interpreter. We watched as a U.S. general passed through to award a Purple Heart medal to a wounded soldier. I tried to be present with my Afghan colleagues, but felt alone with the memories surrounding me and the seriousness of the conflict still raging around us. After their soldier was cared for by the doctors, I touched my interpreter on the arm and stopped my Afghan colleagues in front of the memorial wall. I pointed to the plaques, explaining that these men and women had fallen during my tour, that these were people whose stories I knew and will always remember. I pointed to the photo of Sergeant Pena, explaining that he was killed by the Taliban on a convoy in Helmand province. I pointed to his name on my wristband. As the interpreter translated this into Dari, both officers nodded gravely. “He was a very good man,” I told them, which they understood without translation. The captain pointed gently at the plaque and read aloud: “Pena.” I was floored to hear his name spoken, in the hospital my unit had helped to establish, and by this distinguished Afghan. I realized then what an honor it is to speak the names of the fallen, what a relief it is to bring others into this important remembrance. The memory of Sergeant Pena has been a personal driving reason for continuing my military career and choosing to deploy to Afghanistan a second time. Upon his death, and ever since, I have asked myself: am I doing everything I can to help my fellow soldiers? Ultimately, war is forged by human relationships, at least for those of us on the ground. We work for each other, we work to help each other accomplish the mission—and here in Afghanistan we also work to empower our Afghan colleagues to continue the mission themselves when they are ready. Coming here again is, to me, how I can best honor the men and women who have sacrificed everything in service of a stable, democratic Afghanistan. The successes of past conflicts, the better world that has come about from the tremendous sacrifices of U.S. servicemen and servicewomen over the course of our nation’s history, has depended on our interconnectedness not only with each other, but also with the populace of the places we’ve made safer and better. Our relationships are where the rebuilding and renewal begin, where the seeds of peace and reconciliation can begin to take root. Before we got back in the trucks to head back to Paktya province, the Afghan captain turned and said to me, “Thank you for coming to help my country.” I believe he meant that for all of us who have worked here to honor the dead by making good on their sacrifices. May a better world be the result. This entry was posted in Afghanistan, In the Media, Veterans, War and tagged 10th Mountain Division, Afghan National Army, Afghanistan, Bagram Airfield, Memorial Day, Roger Pena, The Takeaway, WNYC. Bookmark the permalink. Thank you for reminding us about why we are still in Afghanistan and why this and other military actions matter. In the midst of all the hype, it is easy for most of us – who are not sacrificing our time or family members – to forget that this mission is now about making part of the world a better, safer place for our fellow human beings. Thanks for reading and for your kind words, Davina. I hope more people come to realize all of the good things we’ve done in Afghanistan, both with and for Afghans. I’m Roger’s mom and I just want to THANK YOU from the bottom of my heart for always remembering my dear son Roger Pena. I was so blessed with him, he was a wonderful son, brother, father and husband. It’s very hard for me, but just knowing that he has not been forgotten gives me strength. Thank you also for your service and many blessings to you. Thank you so much, Paula. Roger was loved by so many and left such a positive impact on this world as a young man. He will never be forgotten. Remembering SGT Roger P. Pena on Memorial Day in NYC, and later while in the company of Afghan troops during my second tour in Afghanistan. Epic post Kristen! I choked up a bit reading this. All my love and respect, Kristen. Each year I read your words about losing Sgt Pena to the freshmen in the honors college as part of my lecture on the Iliad. Not only do I want them to know about him, but I want them to know about you – because of all you have done and all you will do. An endearing tribute, well deserved, of a dedicated soldier.